The food industry has processed lots of foods to hit that “bliss point” — that perfect amount of sweetness that would send eaters over the moon. In doing so, it’s added sweetness in plenty of unexpected places – like bread and pasta sauce, says investigative reporter Michael Moss. As part of Here & Now’s series this week on obesity, America on the Scale, host Jeremy Hobson spoke with investigative reporter Michael Moss of The New York Times. 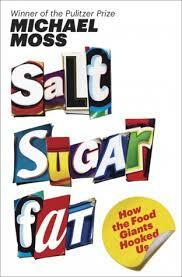 For Moss’s book, Salt Sugar Fat, he went inside the industry and spoke with food inventors and CEOs about how the industry has shaped what people eat and capitalized on how American eating habits have changed — for the worse and, maybe now, for the better. Highlights from their conversation follow, edited for brevity and clarity. I was really struck by how many people inside the industry itself hold their industry totally accountable, totally culpable for this surge in obesity that we’ve had for the last 30 years now. Clearly, there are other contributing factors. Clearly, there are things like exercise and personal responsibility. But they — being insiders — came to believe that all of the effort they put into making their product so irresistible, so tasty, so perfectly engineered to get us to not just like them but to want more and more of them, laid that responsibility directly at their feet. They would hire people like Howard Moskowitz, trained in high math at Queens College and experimental psychology at Harvard. Howard was one of the people responsible for some of the biggest icons in the grocery store. For example, he walked me through his recent creation of a new soda flavor for Dr. Pepper. … He started with no less than 59 variations of sweetness, each one slightly different than the next, subjected those to 3,000 taste tests around the country, did his high math regression analysis thing, put the data in the computer. And out comes this bell-shaped curve where the perfect amount of sweetness — not too little, not too much — is at the very top of the curve. And it’s Howard who coined the expression “bliss point” to capture that perfect amount of sweetness that would send us over the moon, their products flying off the shelf. It’s not that they engineer bliss points for sweetness in things like soda, ice cream, cookies — things we know and expect to be sweet. The food companies have marched around the grocery store adding sweetness, engineering bliss points to products that didn’t used to be sweet. So now bread has added sugar and a bliss point for sweetness. Yogurt can be as sweet as ice cream for some brands. And pasta sauce — my gosh, there are some brands with the equivalent of sugar from a couple of Oreo cookies in one half-cup serving. And what this does, nutritionists say, is create this expectation in us that everything should be sweet. And this is especially difficult for kids who are hard-wired to the sweet taste. So when you drag their little butts over to the produce aisle and try to get them to eat some of that stuff we all should be eating more of — Brussels sprouts and broccoli, which have some of the other basic tastes like sour and bitter — you get a rebellion on your hands. One of the fascinating things I came across in my research is that it was none other than Philip Morris — for years and years, it was the largest food manufacturer in North America through its acquisition of General Foods and then Kraft — it was none other than the tobacco managers at Philip Morris who turned to their food managers [in] 1999 and warned them that they were going to face as much trouble over salt, sugar, fat, obesity as they were then [facing] over tobacco smoking and health problems. Now we’re starting to see that come home for the food companies. This story comes to us via Here & Now, a show produced by NPR and member station WBUR in Boston. Previous post: There is no age limit on cool.